Positive thing is that now my actual F is ok! Fabio, frustrations, I understand. If it makes you feel a bit better, that PIN # here is close to twice that plus additional charge to just look it up, which is stupidly expensive. Jimmy- They have to get the PIN from Ferrari in Maranello. Nobody else knows what the PINs are. Amazing the owners and dealers can lose all that stuff so quickly. Terry, affirmative. $500+, just to look up the PIN. Ferrari sure knows how to milk their customers. Al- Different system from your F430. Originally they came with 3 fobs, one red master, and two keys. You do not need to push the fob button twice to start her. Once you depress the button to unlock her and disarm the alarm and immobilizer, you have 120 seconds to start her. After the 2 minutes if you do not start her, you will need to depress the button again. Read this to understand the fobs. I created a new website for the fobs side of things. I can find a PIN number now in either a red fob or immobilizer if anyone needs help. Just used Gobble's service for my 360, I had only one key and one black remote. Bought 2 keys from Bisel and a new red and black fob from Gobble, I now have a great full set. Ferrari wanted $550 just to look up a pin number, with no guarantee of locating the pin, Gobble's service is a no brainer and was done in a day. Bisel's keys are also fantastic, great job gents. Want to thank Trask757 for his business and kind remarks. 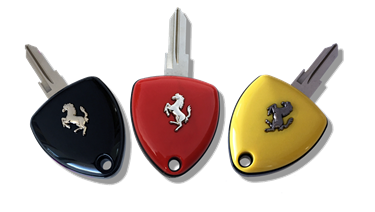 I truly believe these are the keys Ferrari should have made. Much better quality than the original keys.